Jose Felipe Rios, Latino Artist Painter was born in San Jose Puerto Rico. This Puerto Rican Painter discovered his love for painting and talent for working with his hands early in his life. On this site we will introduce you to this Puerto Rican painter, revived by hope, love for a child, a talent for art and the knowledge of who he no longer wanted to be. 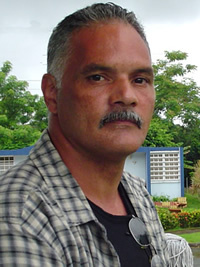 Visit the Biography page and read a brief bio written by this Puerto Rican painter. On to the Gallery to this Puerto Rican painter's works' of art that tell the story of his struggles through life. Continue to the Show page and learn how this Latino artist with Hope, Love and his talent made a come back to his dream come true at Gelabert Studios. Please feel free to browse and give us your feed back. I am excited that you are visiting my site. I hope you find my works of art exciting and to your liking. They express experiences about different times in my life. The painting in this book is Ventannas/Windows By the Artist Jose F Rios Click on the graphic for information on ordering this book. It also contains a brief bio on Jose F Rios . Heather D. Mendoza, University of Arkansas, Fayettville. The following works of art have been reproduced in limited editon Giclée for the first time.